Set Up: Grids of 20x10 with one line at either end as shown. Two tall cones placed inside the grid 3 yards in from the end and 3 yards in from the side. Balls are placed between the tall cone and the sideline. Have one grid set up for right foot turns, and one for left foot turns. 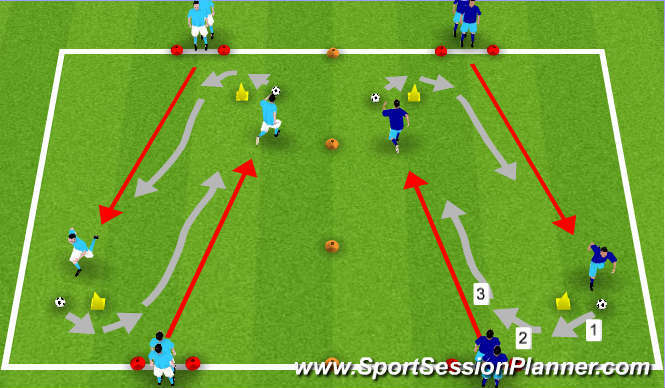 Activity: On coach&apos;s command, first player in each line sprints to opposite end&apos;s tall cone to take ball. 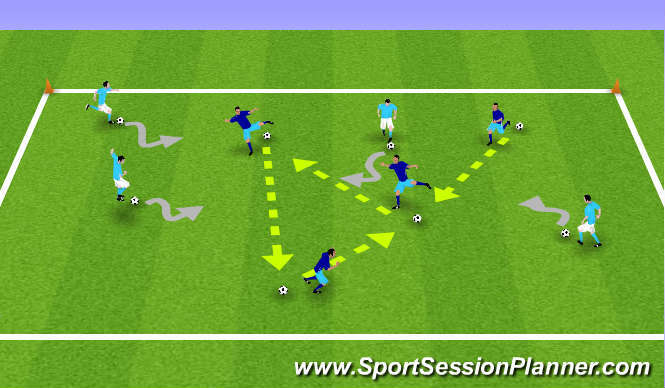 Touches must be done in 3 steps: 1) A "negative" touch towards endline, 2) a touch cutting back towards original line, 3) explosive touch back towards line where they speed dribble to replace ball between tall cone and sideline nearest their line. Coaching Points: Make sure all three touches are done properly, explain that the negative touch is used to touch away from the defender and create a little space, explosive third touch to beat defender. Make sure players return ball to spot where ball was on opposite cone. Set Up: 30x20 wide grid with 2 goals. 2 teams of equal number with neutrals if needed. Activity: Coach has the balls at the top of the grid and plays into designated Attacking team. 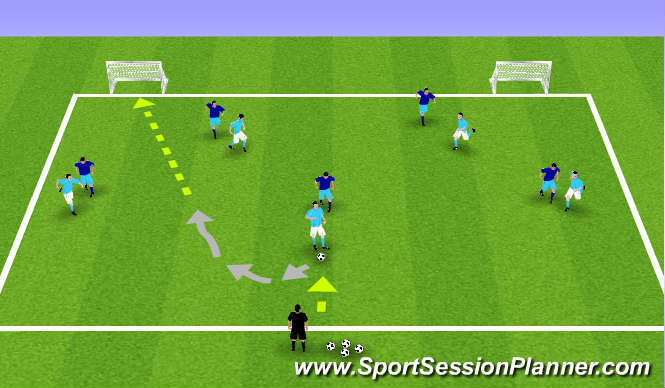 Attackers look to receive with back to goal and turn and face as quickly as possible. 1 point for each goal. Defenders can win point by winning ball and playing back to coach. Possession changes when ball goes out of grid, or if Defenders get ball back to coach. Coaching Points: Quality first touch and turns away from defender, not into defender. Quality passes, and attack either goal. If one goal is closed off, go to the other one.